Lorene Richardson Combee: The games I remember that we played at Lone Maple were Red Rover, softball, basketball, hop scotch, jump rope, and Annie Over, a game that was hard sometimes because we had to throw the ball over the school house. The girls would play under a big beech tree. We would clean off the ground and make rooms with sticks and tree limbs. We used broken pieces of glass for dishes. I remember someone coming to teach us Bible stories on a felt board. I really enjoyed these stories and I learned a lot of Bible stories this way. One of our teachers made a sandbox and we made rivers and outlines of foreign countries in the sand. We learned a lot about the Nile River and many foreign countries in the sandbox. The bigger kids always helped the smaller kids with their reading, math, and spelling. When we got old enough to be in what we called "the big side" of the school, we would have spelling matches. That was always a lot of fun. The first person would spell a word, and the next person would spell a word using the last letter in the other person’s word. When we misbehaved, we would have to stand at the blackboard with our nose in a circle that had been drawn on the board, or we might have to sit on nothing. The way we did this was to sit on a barrel, and then the barrel would be rolled away. One time we had an older man as a substitute teacher. If someone turned around in their seat to talk to the person sitting behind you, he had a long stick that he would slap your desk with, and about scared everyone to death. So we didn’t talk much the day he substituted. At Christmas, we would draw names. The gifts we got were usually a pencil or a tablet, or socks. We always had a play. Someone would cut a big cedar tree that was placed on the stage in the big room. One winter I remember the teacher having a big jar of cod liver pills that she gave each one of us everyday to try to keep us well. I had a lot fun at Lone Maple with all my friends and the good teachers. I wish the kids today had stress free experiences in school like we did. Gene Richardson recalls a time when he knew the next day at school he would probably get a whipping from the teacher, Miss Audrey Holman. Knowing this ahead of time, he made preparations before he left home that day. Unbeknown to his mother, when he got dressed that morning, he put on two pairs of blue jeans, and to be absolutely sure the sting of Miss Audrey’s paddle would not be felt quite as much, he stuffed an old inner tube in between the pairs of jeans. Gene said Miss Audrey told him she would "spank him until he cried," but as it turned out, he remembers that it was Miss Audrey who was in tears before the spanking got over with. Elmo Garrett: "This was a two-teacher school, so each class consisted of four grades. I was in the first grade, but we could watch all the other grades do their work on the blackboard. I clearly recall working with some third and fourth grade students on some of their lessons. Going to Lone Maple was like a new world for me. I had only sisters at home at that time, but at school, I had a few boys my own age to play with. When I was informed that I had a new brother, and they told me what his name was going to be, I told my parents that they could name him anything they wanted, but I was going to call him Joe. The reason for this was because my best friend at Lone Maple was Joe Coleman. I was so insistent that my parents ended up naming my brother Joe. All my good memories of Lone Maple and the students are clouded somewhat by an incident that happened just after that school year ended. One of the older students that was very helpful to me in the classroom and one I considered a close friend was injured in a bicycle accident and died. His name was Clifford Bilbrey. The rules and regulations seemed more relaxed than future consolidated schools. For example, during the lunch hour one day, the teachers let some of the older boys go to my home which was close by to help me retrieve a new litter of puppies from underneath my house. And on the day we lost our home because of a fire, the teacher walked all the students down the road to watch as our house burned down. I believe the older students played a large role in helping the teachers with the younger students as I remember older students very kindly (not bossy) showing me new or better ways to accomplish something. One in particular happened on a field trip back through the hills to a creek and cave. We were told to put our soda pop bottles in the creek to keep them cool. I apparently put mine in a way that it might get washed over and broken when a student a little bit older showed me how to properly put it in the creek. This event left an impression on me as I still remember the day that Kelly Sells kept me from breaking my bottle of Orange pop. Donna Sells Jolley: The first time we ever saw a helicopter flying over was during a school day at Lone Maple. When we heard the noise, we all jumped up and ran outside, even our teacher, Mrs. Dora Maynord. After we got over the excitement of seeing something we’d never seen before and went back inside the school, Dora told us she would excuse us for leaving our seats and running outside this time, but it better not happen again. Raymond Sells remembers a time when several of the students got in a mud ball fight that ended up with Clois Bilbrey getting hit in the eye by Kenneth Winningham with a big mud ball. Mrs. Ardean Coleman was the teacher then, and she gave everybody who had participated in the mud ball fight the choice of taking a paddling or sitting in for a week. Only Raymond and Clois Bilbrey took the paddling, the rest choose just to sit in. Raymond said before the paddling he got was over with, he wished he had made the choice of sitting in like most of the others did. Marie Sells Gunnels did not like going to school from the very first day she started at Lone Maple. Many times, her mother, Eva Sells, would walk across the fields with them in order to make Marie go. Later, Marie’s sister, Donna, would have to carry Marie at least part of the way because she refused to go. For a period of time, Ardean Coleman, who was teaching then, allowed Marie to stay in the "big room" with Donna so she could get used to going to school. But the day came when Ardean thought enough time had passed for Marie to adjust. She was sitting as usual beside Donna when Ardean came in the room and picked her up to carry her to the "little room." But Marie did not go willingly. She said she kicked and screamed and held on to anything she could reach to try and keep from going with Ardean. But it was a losing battle, and that was the last day she stayed with Donna in the "big room." Kelly Sells remembers a field trip Miss Audrey Holman took the students on. They all walked out the road to a spring not too far from the Nelson Cemetery. It was on that field trip he had his first peanut butter and jelly sandwich, something Miss Audrey brought along for everyone on the field trip. Not only was that his first taste of peanut butter, but it was the first time he ever saw or had tasted loaf bread. Kelly also remembers a day when two men came by the school to let Miss Audrey know a mad dog had been seen in the neighborhood. Everyone went home early that day, and most of the students were taken to their homes in Miss Audrey’s car. Another memory is one of a cold, snowy day at Lone Maple when the kids built an igloo one day at recess. After the igloo was finished, Clois Bilbrey crawled inside, but then had a lot of trouble getting out of it after several of the other kids pushed it in on top of him. Kelly and Raymond Sells each had a homemade metal toy called a "wheel" they rolled along as they walked across the fields on their way to Lone Maple. Raymond still has the one he rolled along as they walked to school each day. It took some skill and concentration to keep the wheel up and going as the person using it walked along. Listening to harmonica players Wayne Raney and Lonnie Glosson on the radio was something else Raymond and Kelly did while they were growing up. They each got a harmonica by mail order, and eventually Raymond taught himself how to play. He still continues to play, was asked to do so as part of the Christmas program at Hatcher Hall Christian church this past year. All the Sells cousins remember well the day Lynn Reagan accidently caught his overalls on fire. Lynn was missing a button on his overalls and a wooden match that had been bent was placed in the buttonhole as a temporary fix until the button could be sewn back on. After coming in contact with something metal on Lynn’s desk, the match head caught on fire. When Lynn realized what was happening, he started running around and around the room hollering, "Miss Audrey, I’m on fire! I’m on fire!" A little trail of smoke followed him as he ran, creating the scene similar to an airplane about to make a crash landing. Miss Audrey was finally able to catch Lynn and put out the fire before any harm was done. Wilbur C. Smith: "I began attending elementary school at Lone Maple during the 1926-27 school term with an enrollment of 60 students. The first year for beginners was called the primer, but one could advance to the first grade if all requirements were satisfactory. This class was rarely a large one. Miss Georgie Lee Mathis was our teacher during this particular year. The school got its name from a large maple tree that stood near the school and hung over the road. The grounds were donated by the Taylor family. The old school building is still standing. All students who went to school there walked from a radius of three miles. Hours were from 8:00 a.m. to 4:00 p.m. with a school calendar from July to March. We had three recesses to enjoy playing common games such as "fox and hound." The only closing of school as during "fodder pulling time." School was held even during a really large snowfall. We took our "dinner" (not lunch) in gallon syrup buckets or in a "paper poke." Dinner consisted of a big, ripe tomato, an apple, a peach, corn bread, ham meat, or a baked sweet potato. Those families who had flour for biscuits and jelly were rare which caused the less fortunate to have a hankering taste. The only bathrooms were outside toilets. The girls were more fortunate than the boys. We used fence rows near the roadside which took longer to make the trip. The usual way to notify the teacher and other students was to place a book near the door. Boys used one door and the girls the other. This was a good time for older boys (maybe girls too) to roll a cigarette from pocket crumbs they carried that came from home grown tobacco. My second year was 1927-28 with Miss Vonda Maynord as teacher. She was a cousin to the late Carvel Maynord, and boarded with the family. She was very much loved and accepted well by our community and school. Teachers were paid very little. If the county was short of money, each teacher would have to hold the check for sometime, or take a discount from someone who had sufficient funds to cash their monthly pay. Teachers were responsible for the wood to heat the pot-bellied stove and often had to find someone in the community to cut wood for the school. This was done with the hope that the county would at some point reimburse the person providing the wood. Teachers never were free from having students break some of the rules. The punishment might be a switching with a limb, or standing in the corner, or by holding your nose in a ring on the blackboard. I remember only one punishment from Miss Maynord when she placed me under the heater for a period of time. Of course, the stove wasn’t hot because it was in the month of August. This was the "good ole days." 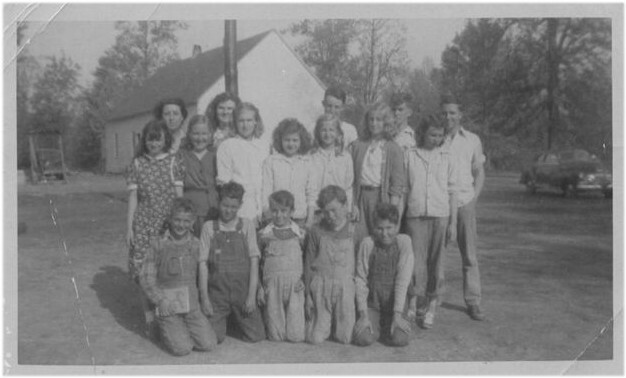 Pictured out back of the Lone Maple school near Taylors Crossroads is the 1948 5th through 8th grade classes. Front row: Linus Dennis; Troy Daniels; Raymond Sells; Odell Leach; Clauis Bilbrey. Second row: Margaret Dennis Colson; Omagene Winningham Garrett; Lyndel Winningham Arney; Amelia (Melia) Stover Hanahan; Lorene Richardson Combee; Donna Sells Jolley; Aletha Stover Gunnels. Third row: Mrs. Dora Maynord, teacher; Joyce Wright Denny; Eugene Bilbrey; William Sells; and James Garrett. Photo courtsey of Lorene Richardson Combee.The car shown in the background belonged to Ardean Keisling Coleman, wife of Bill Coleman, who taught the lower grades at Lone Maple.